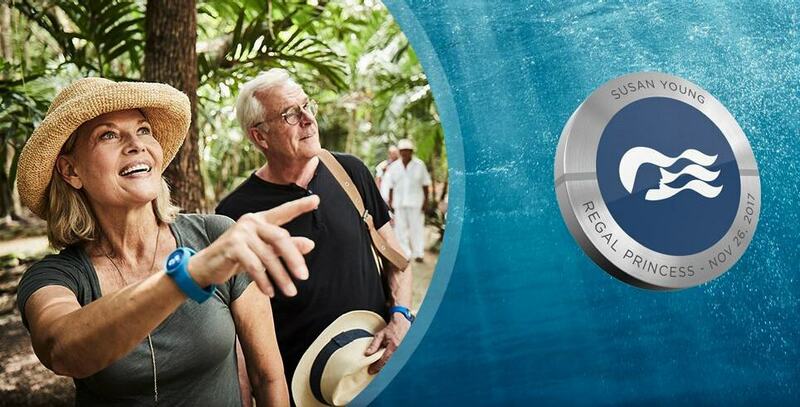 Princess Cruises will be the first Carnival Corporation brand to feature the Ocean Medallion™, a wearable device powered by a first-of-its-kind interactive technology platform within the O·C·E·A·N, One Cruise Experience Access Network. The Ocean Medallionenables a new level of personalization that delivers an enhanced guest experience previously not available in the global vacation industry. Carnival Corporation CEO Arnold Donald unveiled the Ocean Medallion today during his opening keynote at CES 2017, the world’s largest consumer technology trade show. The Ocean Medallion is the only accessory needed to elevate the guest experience on cruises. Ocean Medallion Class™ will be available November 13, 2017, onboard Regal Princess, followed by Royal Princess and Caribbean Princess in early 2018. Medallion Class makes Ocean Vacations more personal, immersive, simple and seamless than previously considered possible. At the heart of this personalized experience is the Ocean Medallion, which enables endless vacation possibilities.The Ocean Medallion has no discernible technology – no on-off switch, no charging, no menu to navigate – and can be worn as a pendant on a wristband in a clip or simply placed in a pocket to reveal enhanced services and personalized experiences without guests having to push a button or take any action. The pre-cruise engage will allow guests to provide preferences that detail their wants, needs and desires so that their onboard experience can be personalized. Pairing with the Ocean Medallion is the Ocean Compass™ (for both guests and crew). The Ocean Compass is a personal digital experience concierge accessible by all guests using interactive displays throughout the ship, on stateroom TVs or via guests’ own mobile devices. For example, guests can find their way to venues around the ship; make reservations at the Lotus Spa, specialty dining restaurant and shore excursions; arrange celebrations; view photographs; learn about the destinations they will visit and activities at each port of call and more. The Ocean Compass via Ocean Concierge will invite guests to experiences based on their individual needs, wants and desires. THERE and THEN™: Guests can place a beverage order and have it delivered to where they plan to be at adesignated time. For example, guests wanting to enjoy a glass of wine at the theater can place an order prior to the show and it will be delivered to them at their seat.